1. Embrace a sociable layout. 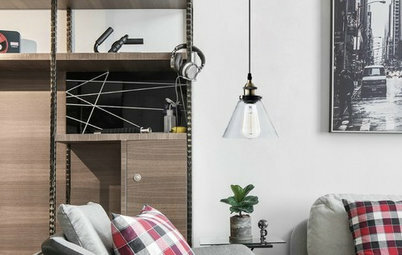 While its small footprint may at first seem to be a drawback, the single-wall kitchen encroaches less on an adjoining living area compared with other layouts, freeing up more space for you outside the kitchen. 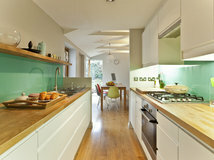 The layout in the picture, typical for a single-wall kitchen, complements contemporary open-plan living. 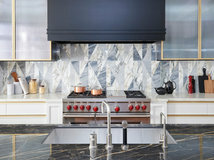 The single-wall kitchen is generally designed so only one person can cook at a time — a limitation that makes the kitchen safe yet still convenient for others to access. It’s important to keep this aspect in mind to ensure a design that accommodates the users’ needs and lifestyle. 2. Plan an efficient design. 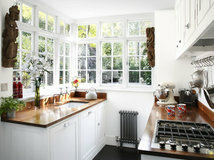 With any kitchen, careful planning is important, but it’s even more so when space is limited, as it is in this layout. Typically (but not always), a single-wall kitchen includes a fridge on the far end of the kitchen run. 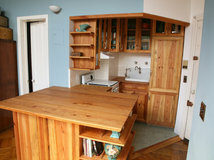 This would have the sink next to it, with counter space on either side, and your dishwasher and storage beneath. The oven and cooktop are usually located on the far side of this. Again, there should be counter space on either side of the range to allow you to safely place food after cooking. More storage space would be provided beneath. 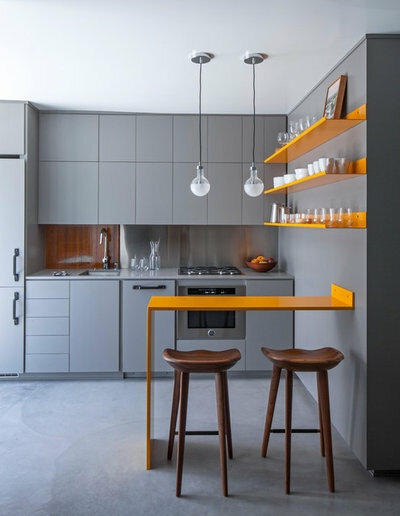 Alternatively, as long as they don’t block the light source, you could have tall cabinets bookending the kitchen. This would usually include an oven in tall housing on one side and a fridge-freezer on the other. 3. Stick with a standard run of cabinets. Above the lower cabinets, there’s usually a run of upper cabinets, sometimes with a tall cabinet at one or both ends. Your exhaust fan and housing (if applicable) are also located in this run. The cabinetry may stretch the full length of the wall. 4. 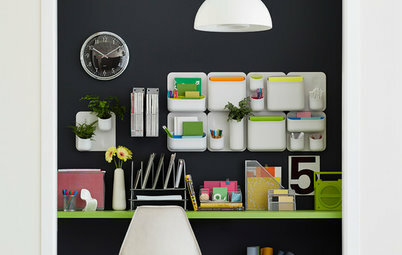 Go for mixed shelving. 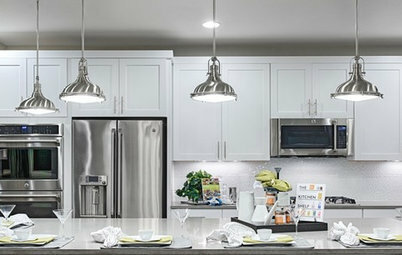 Alternatively, you could break up the cabinets with an exhaust fan or open shelving. Shelving on the wall to the left or right of the kitchen is another option, and it’ll be decorative and practical. 5. 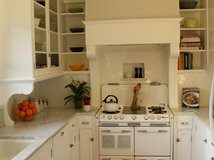 Install bridged upper cabinets. Depending on the available space, another option is to introduce a run of bridging cabinets along the top of your upper cabinets. These usually have tall cabinets on either side. 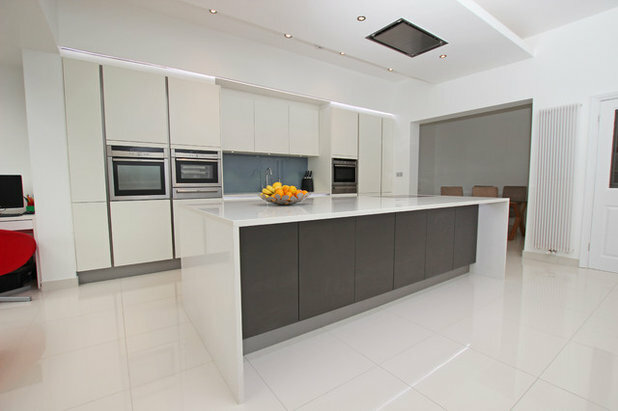 Apart from extra storage, this creates a sunken effect for the upper cabinets through subtle changes in depth. The upper cabinets are about 14 inches deep, and the top cabinets are about 26 inches deep. 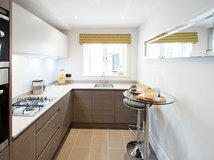 The overall feel of this is a framed kitchen look, or a feature wall effect. With this arrangement, it’s best to store items used less often in the top cabinets and to invest in a foldaway footstool for access. As pictured, you can also match your kitchen cupboard and wall colors for a seamless look to your kitchen and dining or living space. 6. Max out your storage. 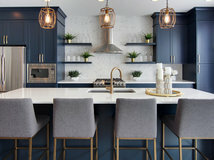 Storage is important in any kitchen, large or small, but it’s particularly key with a single-wall kitchen, where there are fewer cabinets than in other layouts. 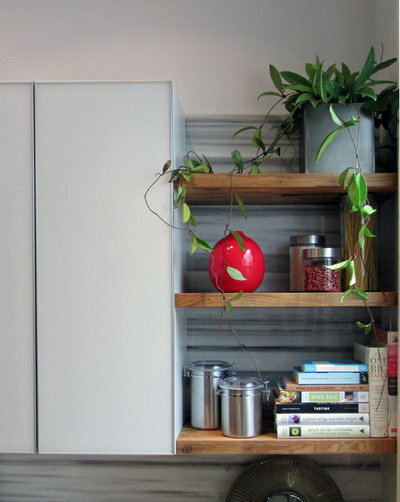 Ensuring generous cupboard space is a must, but also consider whether there’s potential for more storage elsewhere in the kitchen. 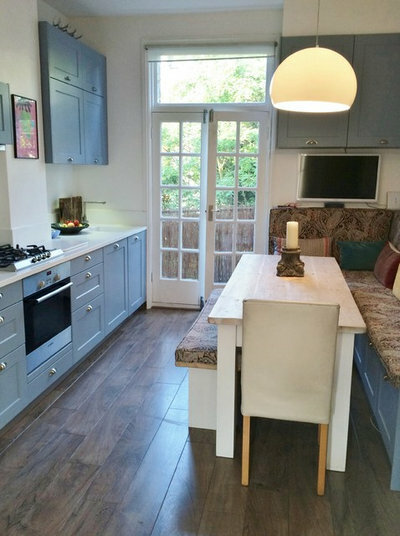 The designer of this small cook space cleverly added storage underneath the seating area and packed in even more with upper cabinets above it. The furniture outside the immediate kitchen area was also designed in the same finish to unite the spaces and create a fluid look. 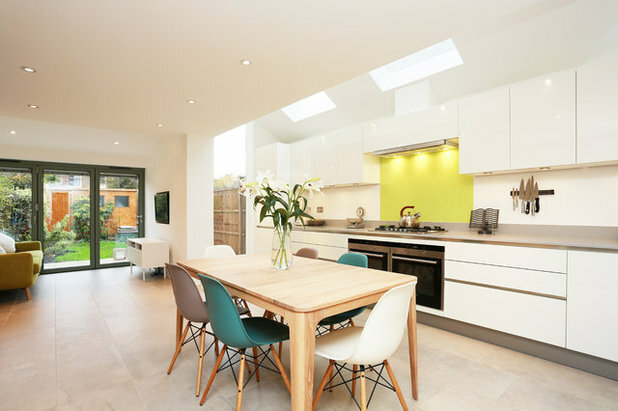 This approach is becoming increasingly popular for open-plan spaces, where homeowners want to achieve a feeling of continuity between their kitchen and living areas. 7. 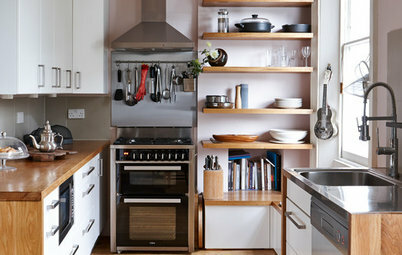 Choose appliances to suit a small space. Though a single-wall kitchen may be small, this doesn’t keep you from including the appliances you want. Many modern kitchen appliances are specifically designed for small spaces. For example, you can find integrated compact dishwashers, plus compact ovens, microwave ovens, steam ovens and warming drawers. 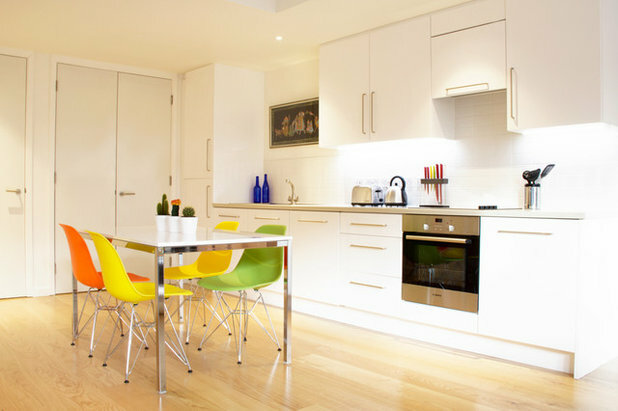 In an open-plan arrangement, it also pays to choose your appliances wisely and ensure that you go for quieter models. This way, if your washing machine or exhaust fan is on, you’ll receive far less objection from the person watching TV or reading in the adjoining space. 8. Add an island. When planning your kitchen layout, it’s worth exploring whether you have space to add an island parallel to your single-wall kitchen. With careful planning, this will enhance the layout. 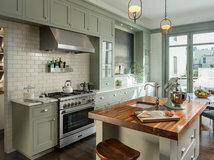 It can also make the single-wall layout work for larger spaces since, in effect, it reconfigures the room into a galley kitchen with the same functionality. 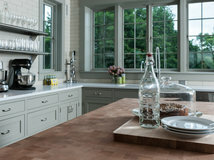 While this depends on your space and how you want to use it, generally speaking, the additional work surface and storage an island introduces can be extremely beneficial. 9. Delineate the space. 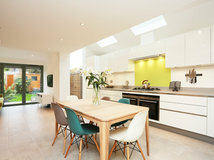 If a kitchen island won’t fit, you may consider adding a table, both for dining and as an extra work surface. 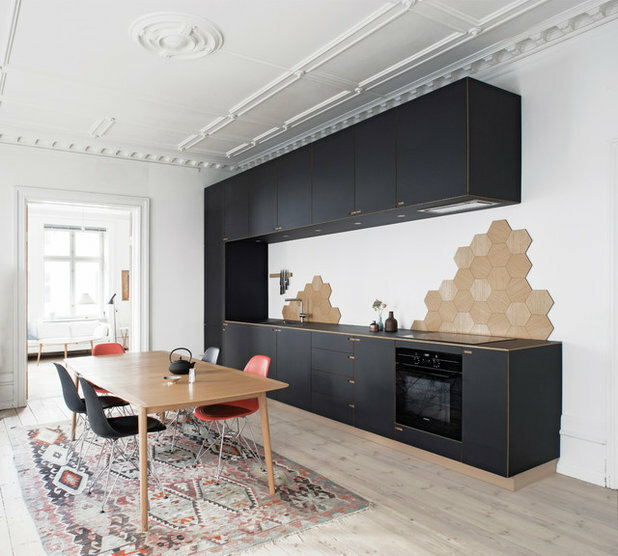 Aside from the obvious benefits this brings, a table can also mark a distinction between the kitchen and living room, creating the feeling that they’re two separate spaces. 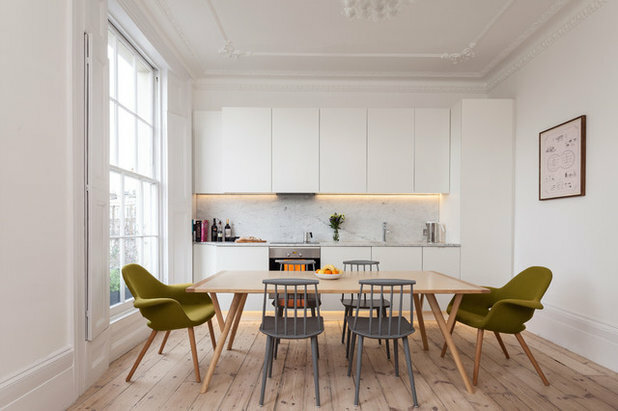 Other ways you can achieve this effect are through a breakfast bar with stools (great for entertaining guests) or a change in the flooring between each area. 10. Highlight one feature. 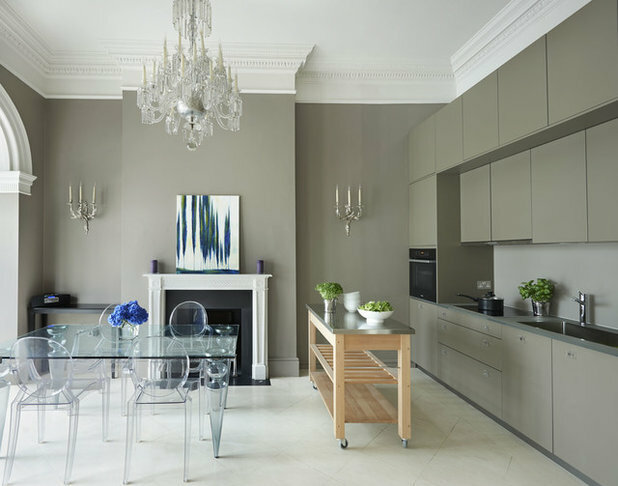 It may be that you want unfussy cabinets for a clean and understated look. 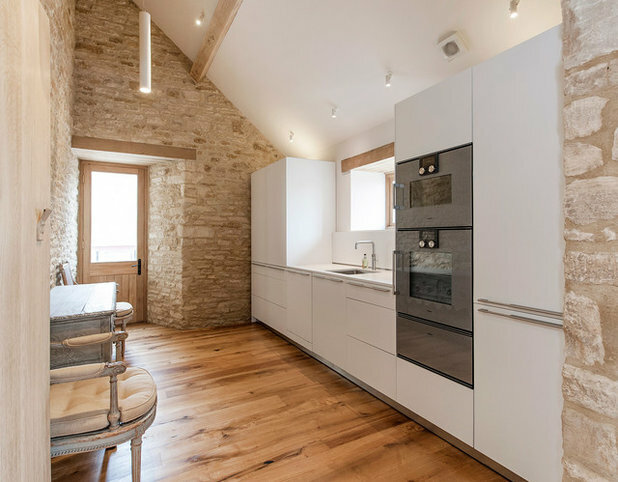 This is a popular choice that can also be used to highlight a different aspect of your kitchen, as with the stone feature wall pictured here, which stands out more than the minimal white cabinets. 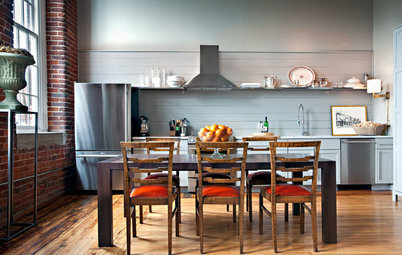 Or perhaps you want to make the single-wall kitchen itself the focal point. 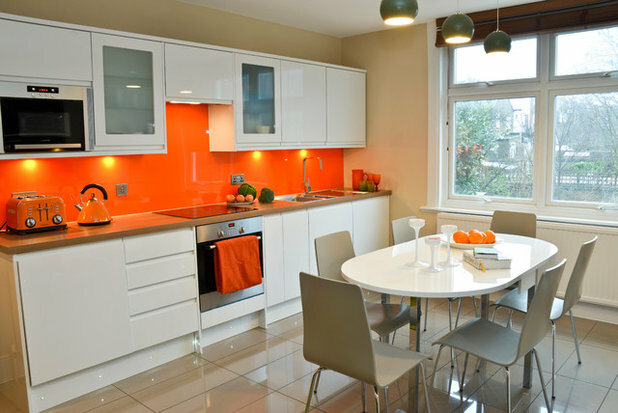 You could contrast it to the rest of your room with a bold splash of color in the cabinetry. 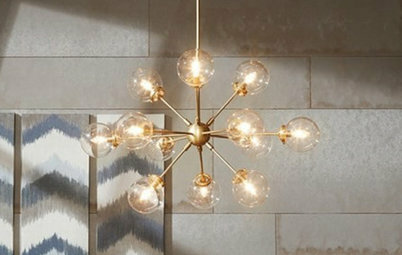 Alternatively, you could opt for statement shelving or a distinctive backsplash. 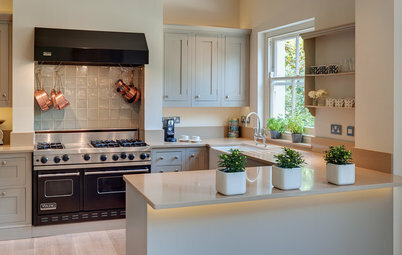 Whatever your preference, a single-wall kitchen is worth considering if you have a small space and are trying to work out the best layout for it. There’s far more to this layout than meets the eye and lots of workable options to make it right for you. Tell us: Do you have a single-wall kitchen? If so, how do you make it work well for you? Share your tips and photos in the Comments below. 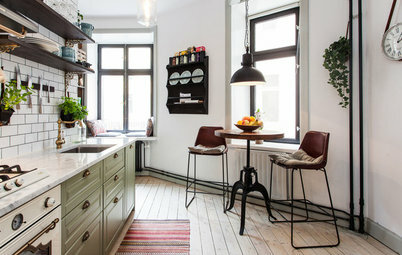 Does anyone have an economic way of constructing pocket full height doors for a small straight run kitchen to enable the whole kitchen to be closed off? Anyone liking the construction and layout of this space may like to talk to us as we created it! 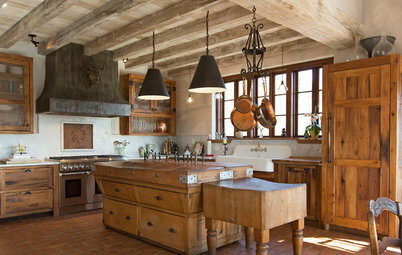 I don't think a one-wall kitchen limits you to one cook if you have an isle 4 feet wide. Also, with a parallel island, people can be chopping & mixing at the island with everyone working communally on creating dinner. The problem come in with opening the doors of the dishwasher, ovens, fridge & blocking passage. You have to design carefully for isle space with apploance doors open.